Inmotionhosting has been in the business since 2001 and they've carved a niche for themselves in the business hosting realm as well as catering to individual needs. Their hosting portfolio offers a dedicated server plan, a VPS plan, a shared host business plan and a personal plan that won't break your bank. Their offerings are feature rich, almost to the degree of "if you can think of it, they offer it". Plan on plenty of disk space and bandwidth, secure POP3/SMTP email, eCommerce, loads of scripts, and MySQL databases. And regarding an issue that is important to many users, their 24/7 technical support staff are located in the United States. With state of the art data centers on each side of the country, their unique "Speed Zone" program loads your data on the server geographically closest to you. A particular point of pride for them is the difficult to get CNET Certified Service Provider 3-Star rating they've earned for nine consecutive years. This host is one of the most professional businesses I've ever dealt with. There are no lags in support or taking care of their customers. If you are searching I would recommend them highly. Am happy here, no more searching around for someone decent. They take care of my every need without complaint. Take a look. In motion is a very good host, they are easy, professional and have good support staffs. You won't be left high and dry waiting on anyone to help you. Try them! Yes, I am the cheerleader for this group! You will know why if you move here and that is what I would recommend. My time here has been nothing but agreeable and satisfying. There is nothing they can't handle and the few times there are issues they have been on it immediately You should check it out!. Inmotion has been quite a good place for my clients, all moves along smoothly most of the time. Of course there are hiccups but those are handled quickly and professionally. Would recommend them for those looking for a new host. Inmotion has been primarily a positive experience here for me. They are keeping me satisfied and my clients too. They have been there whenever issues came up, handled them with quick ease. Inmotion is taking care of business, they have answered any time I've contacted them. They truly seem to want to do the best they can, if that continues I can definitely recommend them. I have so much time now that I'm here that I could spend some time on the shore! With no issues to really speak of they let me focus on other things, which is great! I would recommend them. Inmotion does a pretty good job, there are somethings they could approach in a better manner IMO but I don't run a host so as a client I have been pleased with their response and resolutions. I have worked with InMotion Hosting for clients. Their customer service is great - both by phone and email. No matter what time of day or night I called, I reached a pleasant person that was more than willing to help me until I was satisfied and understood what I was confused about. The clients that I work with have a great record of always being up and running. 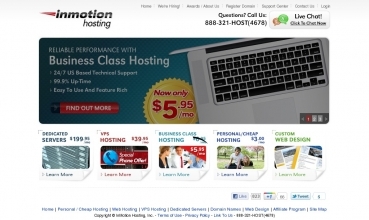 It's been a positive experience using and working with InMotion Hosting. This site is good for my needs, I don't have a lot on here but what is here has been handled just fine. They appear to know what they are doing so am going to stay with them, and I would recommend them to someone if they are looking. I have been with inmotion for a while now and they have mostly been a beneficial site for me. Their were some pricing issues at the outset but that was resolved. The support has been pretty decent but I havn't had too many issues to report to them. I did live chat with them. I was given the "old" up-sell pitch to the Power Package. I agreed, was given $10 off then, given a quote. After that quote, was told it was wrong and price went up $15. Then said I wanted lesser package, was given one price and before I could pay, the price went up $10. Everyone must work on commission or they need a first grade education in math. Give me a break. No honesty here with sales people, so imagine how the rest of the company is run. Even if this site rates them "best", I rate them shadiest.